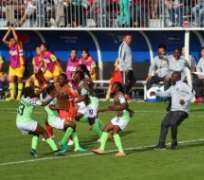 Nigeria's Super Falcons beat the Shepolopolo of Zambia 4-0 on Wednesday at Cape Coast in Ghana to return to contention at the 11th African Women Cup of Nations (AWCON). The defending champions, who lost their opening match on Sunday, bounced back into contention with an emphatic win which sent them to the top of the group's table, at least temporarily. The group's top two teams will advance to the semi-finals.